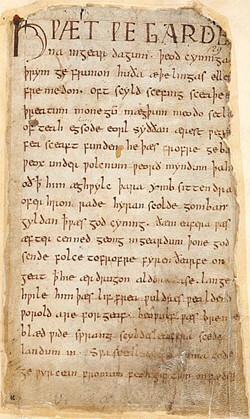 First page of Beowulf in the only surviving manuscript, dated to around 1000 AD. 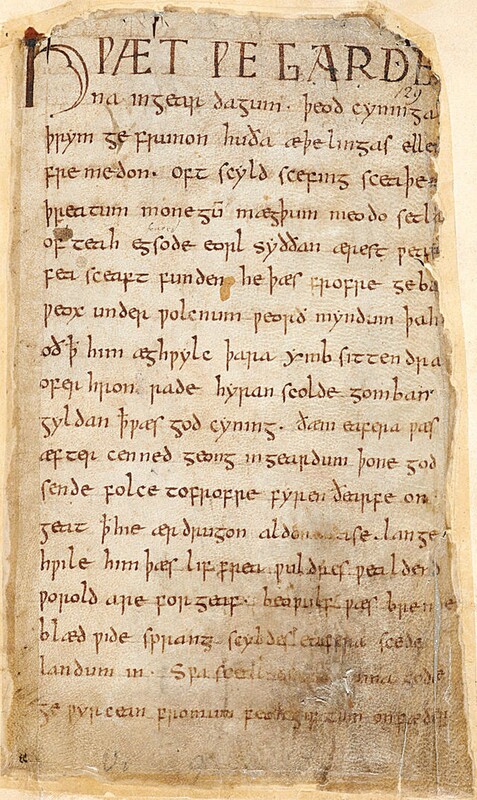 The poem has been dated to about 300 years earlier. "He who saw all, who was the foundation of the land, who knew (everything), was wise in all matters: Gilgamesh." Homer's Iliad, written down around 750 BC, vies with Gilgamesh as the world's earliest great work of literature. The Iliad and its literary twin, The Odyssey, were probably composed around 1100 BC, passed down orally, and only codified with the rediscovery of writing following the end of the Greek Dark Ages. The Iliad had a profound literary and religious significance for the ancient Greeks, comparable to the regard we have for Shakespeare and the Bible. "Sing, O goddess, the anger of Achilles son of Peleus, that brought countless ills upon the Achaeans." The Bible, dating from around 600 BC in written form, is easily the biggest bestseller of all time with over 100 million copies printed in various translations and configurations. "Lo! The glory of the kings of the people of the Spear-Danes in days of old we have heard tell, how those princes did deeds of valour." The Tale of Genji, from about 1000, is sometimes cited as the world's first novel. Written by Murasaki Shikibu, a Japanese noblewoman, the book follows the lives of some 400 (!) courtiers during the Heian period. I love the question in parentheses in the opening with the coy implication — I can't say it, but you all know who I mean! "In a certain reign (whose can it have been?) someone of no very great rank, among all His Majesty's Consorts and Intimates, enjoyed exceptional favor." Don Quixote, 1605, aka The Ingenious Gentleman Don Quixote of La Mancha, usually beats out Genji for the world's first modern novel, at least in the West. Miguel de Cervantes recounts the rollicking, bittersweet adventures of a brave-but-dotty old nobleman who has read so many stories about chivalrous knights that he thinks he is one. Elizabeth Grossman's recent translation is completely accessible to a modern reader. "Somewhere in La Mancha, in a place whose name I do not care to remember, a gentleman lived not long ago ..."
Barry Evans (barryevans9@yahoo.com) is with Groucho Marx: Outside of a dog, a book is a man's best friend, etc.